Of all bird characteristics, none is more unique than bird feathers. No bird is without feathers, nor is there any other kind of animal that has them. The most basic function of bird feathers is protection. A featherless bird isn't a happy bird. Birds need their feathers to protect their body. 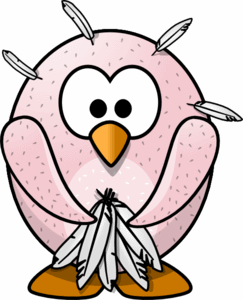 When its cold, feathers trap air underneath and muscles connected to the feathers allow a bird to fluff itself up to entrap more air. When birds are hot, they compress the feathers to eliminate these heat-trapping pockets of air. Bird feathers also serve as raincoats. Many birds apply oil to the feathers from a gland at the base of the tail (uropygial gland). 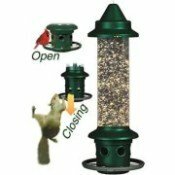 The gland secretes an oil that the bird squeezes out with its bill and then applies to its feathers for waterproofing and also for inhibiting the growth of fungi and bacteria. There are a few birds, like cormorants & anhingas, that lack the oil gland and must spread their wings out to dry after being exposed to water. Once formed, any feather is a dead horny structure without living cells. It receives nothing from the body but physical support. The typical contour feather is made up of a central shaft and a vane. 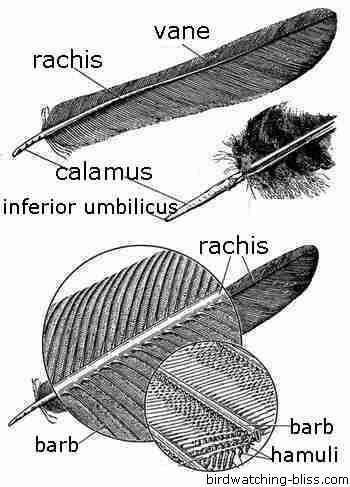 The bare end is called the quill or calamus. The pointy end of the feather is called the inferior umbilicus. This is the hollow opening where when the feather was growing it received nourishment. The portion of the shaft between the two webs of the vane is called the rachis. The vane is made up of numerous barbs or rami, small toothpick-like rods or filaments arranged in a closely parallel fashion on both sides of the rachis, running outwardly and diagonally toward the feather tip. There are usually several hundred barbs in each web. These barbs are held together by tiny barbules or radii. 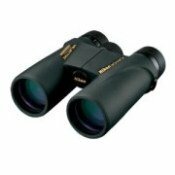 There are microscopic hooklets (barbicels or hamuli) that help lock the barbs in place. If two adjoining barbs are separated, the bird merely needs to draw the feather between its bill as in preening to lock the barbules' hooks and flanges together again and restore the entire web. You can do this with a feather as a bird would. Separate the barbs by unhooking the barbules, then "zip" them back together by pressing them between your fingers. Vaned or contour: Form the outer coverings of a bird's body, including the wing & tail feathers. Down: Layer of loosely structured feathers beneath contour feathers which help to trap air near the birds body for warmth. Nothing beats the warmth of down! Semiplume: Loose & fluffy feathers similar to down feather; provides body insulation and increases the buoyancy of water birds. 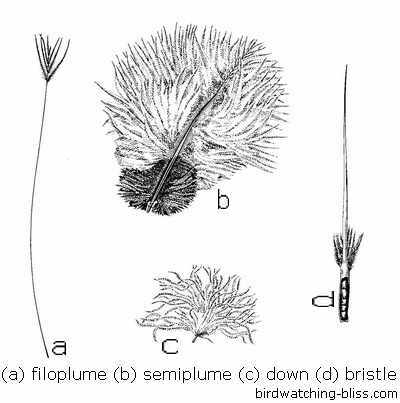 Filoplume: Small hair-like feathers with a few barbs at the tip of the shaft; they occur among the contour feathers. Bristle: Modified, vaneless contour feathers with only a few barbs at the base on a small, stiff rachis. They can occur around the eyes, nostrils, and in flying insect-catching birds (such as tyrant flycatchers & goatsuckers) around the mouth, called rictal bristles. Powder down: Feathers that grow continuously and are never molted. 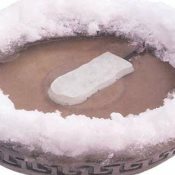 The barbs at their tips constantly disintegrate into a fine, talc-like, water-resistant powder. Often abundant in birds that lack preen glands. Along with bird feathers, learn about other bird characteristics. 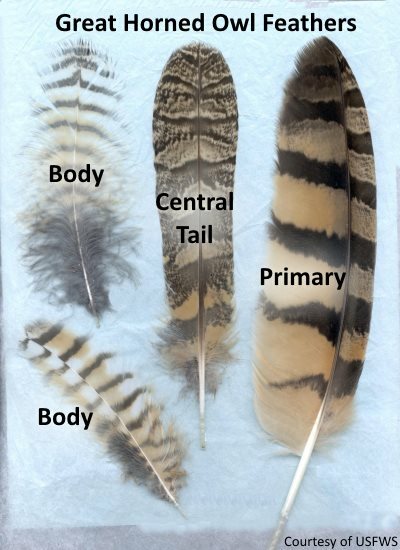 USFWS Feather Atlas - Database of scanned feathers from North American birds to assist with feather identification.